Last minute deals to Costa Rica up to -70% off To take advantage of these offers, join now for free! 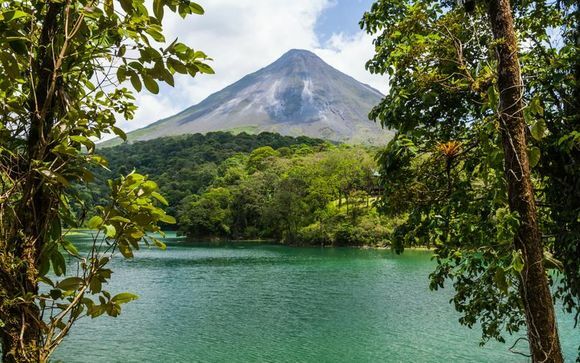 Book last minute deals to Costa Rica and discover more about this country’s stunning palm-fringed beaches, verdant landscapes and national parks teeming with wildlife. 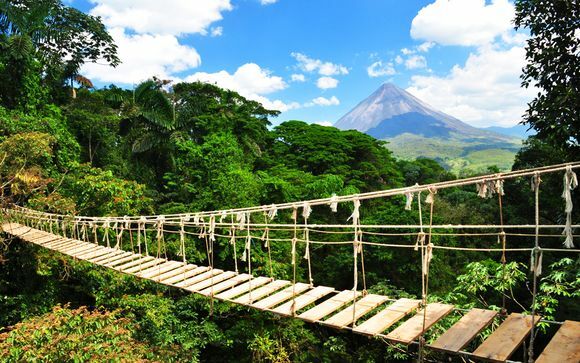 Costa Rica is undeniably one of the most beautiful countries on the planet. Situated just north of the Equator in South America, it’s one place that you’ll want to remember to take your camera because the array of scenery and wildlife will take your breath away. The southern half of the country is dominated by rugged mountains and volcanoes, the highest of which is the towering Chirripó Grande. The heart of Costa Rica is the capital, San José, right in the central valley area where 70% of the population live. 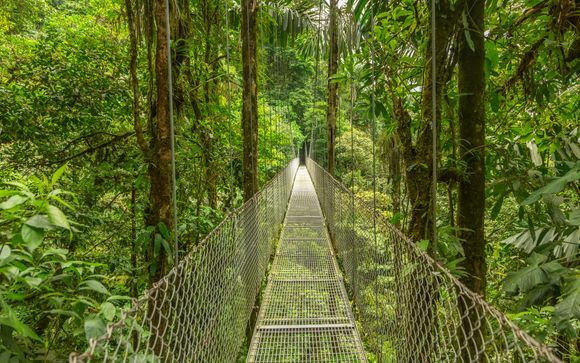 One of the most unmissable features of any last minute deals to Costa Rica has to be checking out treetop views while canopy walking in Santa Elena or spending time exploring the beautiful Monteverde Cloud Forest Reserve which offers high altitude activities like wildlife trails, canopy walks and a 300 ft suspension bridge. If heights aren’t your thing, Costa Rican beaches and water-based activities are a major attraction for any traveller on a luxury holiday. Spend a laid back day out whale watching in Drake Bay, or discover the Corcovado National Park, famous for being one of the most biologically diverse places on the planet. Here, you can take in romantic sandy beaches and marvel at the tropical rainforests. For an adrenalin rush you could try white water rafting on two of Costa Rica’s most turbulent rivers, Reventazón and Pacuare. The central valley is fantastic for culture, with San Jose’s museums and galleries to discover amid the chaotic sprawl of a bustling urban city. You’ll find the Teatro Nacional, the Legislative Assembly building and Catedral Metropolitana here, along with the National Museum and the Museum of Pre-Columbian Gold. Away from central Costa Rica is another gem, the Centro Neotrópico Sarapiquí which is in the Northern Lowlands, and the best place to find out more about the indigenous cultures of Costa Rica. The local cuisine is another positive for travellers enjoying last minute deals to Costa Rica, and if you enjoy Jamaican style jerk dishes and Caribbean influenced cooking, you’ll have no trouble finding delicious food. Another speciality, the locally caught sea bass, is divine. Most of the best eateries are in San Jose, which has a lively nightlife and a wide selection of high quality restaurants for discerning travellers. For shopping, you can pick up bargain luxury goods in the city’s malls, but head out to the smaller villages and you’ll find gorgeous markets with handmade goods, and home grown coffee beans. 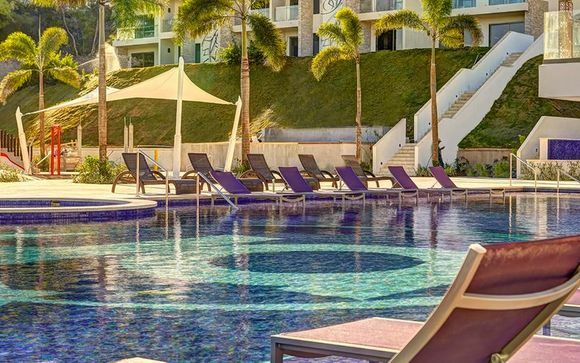 Browse the range of luxury holidays and amazing discounts, or sign up to get exclusive discounts for last minute deals to Costa Rica and more straight to your inbox.